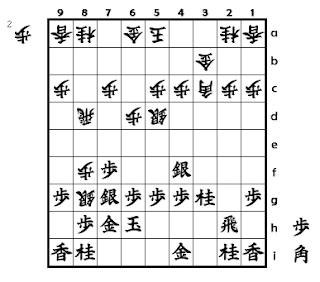 Yamajunn's Shogi opening traps: Hayakkuri Gin in Ittezon Kakukawari ; part 2. Why you shold move such a way ? Hayakkuri Gin in Ittezon Kakukawari ; part 2. Hayakuri Gin in Ittezon Kakukawari ; part 2. In the diagram 1 , Sente already has difficulty to attack Gote's camp or advanced his own camp . If Sente don't start attacking , Gote will push his Pawn ; 4d --> 4e , and Sente must back his Silver 3g . Then Sente start attacking with P-3e , and game will advance like following moves . 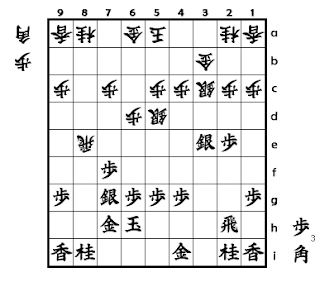 In diagram 2 , Gote gets a fork on 3e Silver and 8i Knight . Sente can't protect both piecies and Sente will get bad position . Sente can avoid this fork by 15.P-2d instead of 15.Px8e . But in this line , Sente's camp will advance bad formation P-8h . I will show one example moves below , and Gote will get advantage . I am a Japanese man , now living in Saitama. 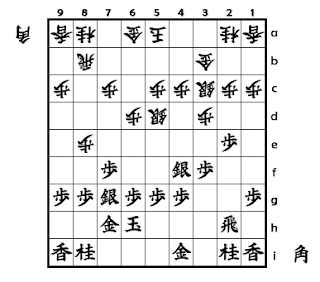 I call myself "Shogi evangelist".